A few private shuttles waited for riders on Summer Street in Boston. The Massachusetts Convention Center Authority has a plan for shuttles. 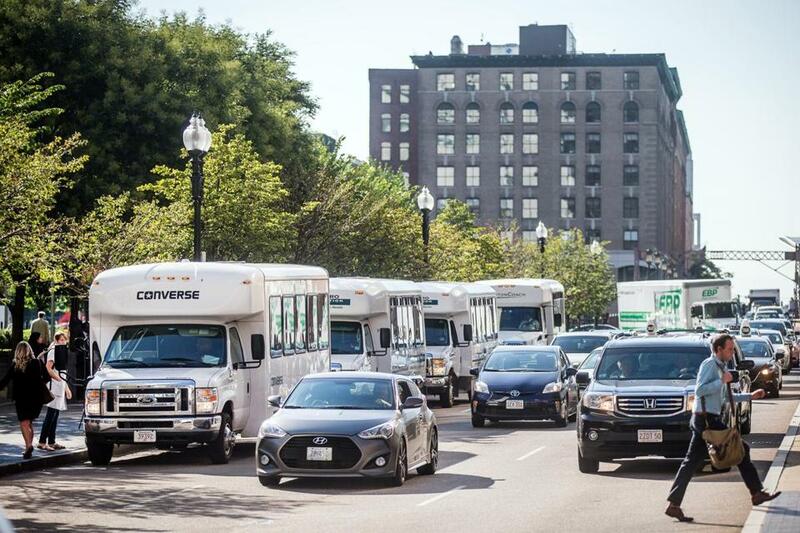 Dozens of company-sponsored shuttles circulate through the traffic-clogged Seaport every rush hour, adding to the snarls as they bring workers back and forth between the jammed waterfront and North and South stations. To help solve the problem, the Massachusetts Convention Center Authority wants to consolidate most of the 20 private shuttle routes on the South Boston Waterfront into two routes that it would manage, as soon as Jan. 1. The goal is to increase efficiency and reduce the number buses contributing to the sometimes apocalyptic lines that cripple key roads out of the Seaport every weekday afternoon. The Seaport bus logjam is relatively new. A decade ago, only Fidelity Investments had shuttles circulating, after the mutual fund manager built its Seaport complex, an outpost at the time in the midst of parking lots and warehouses. As more offices opened along the waterfront — wiping out parking and later crowding the MBTA’s Silver Line service — more employers and landlords added their own shuttles to the mix. The numbers added up. 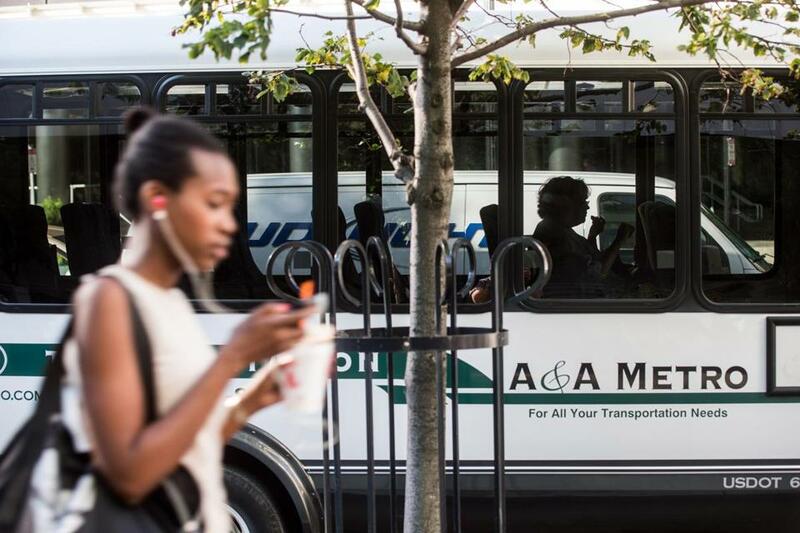 As of last July, as many as 34 buses circulated across the area at a given time, for a total of 74 shuttles a day, funded by 10 employers or property managers. Collectively, they spend nearly $6 million a year to shepherd 1,100 to 1,300 workers to their destinations at peak times. “They’re all going one behind each other, and they’re all lining up curbside to pick people up and then lining up one behind the other to get back to the waterfront,” said Lauren Grymek, executive director of the nonprofit Seaport Transportation Management Association. Grymek’s group is working with the Convention Center Authority on consolidating the shuttles. Their biggest challenge: getting a critical mass of employers on board. They are talking with companies that sponsor shuttles to persuade them to join forces and help pay for the new service. Some are employers — Vertex Pharmaceuticals, Fidelity, John Hancock — while others are property owners or managers. The goal is to secure a half-dozen companies willing to drop their existing buses and instead climb on board the agency’s new service by the end of September. So far, no one has committed. But Fred Peterson, the convention agency’s interim executive director, remains hopeful. The project represents two initiatives dovetailing into one. Consolidating the shuttles was a key piece in a far-reaching plan, funded by waterfront players, to address the gridlock. The report, made public in January, offered a long list of fixes big and small, from repairing and reopening the old Northern Avenue bridge for vehicular traffic to adding more Hubway bike-sharing stations in the area. The Convention Center Authority is also diversifying its revenue streams. The agency is trying everything from branching into event development, to selling ads for its prominent digital billboard, to hosting concerts by the likes of Passion Pit and Edward Sharpe and the Magnetic Zeros. Overseeing the new shuttle routes isn’t much of a stretch for the agency. Peterson said it already has its own transportation department that manages shuttles for many of its events, helping convention attendees get to and from their hotels and outlying locations. Convention Center Authority officials expect to shave a half-dozen companies’ total shuttle costs by 30 percent, from $4.3 million to $3 million, once those routes are consolidated. One route would be focused on buildings along Seaport Boulevard, while the other would traverse Summer Street. Both would loop in North Station and the Blue Line, while the Summer Street route would also go to South Station. The job would be put out to bid to a private shuttle service, ideally later this fall. Workers would show an ID to hop on board for free, just as they do now. Members of the public wouldn’t typically be allowed, though Peterson said shuttle drivers may wave them through on bad weather days. Eventually, other companies would be invited to join, and trips to the Back Bay and other locations could be considered. There are already several successful models in the Boston area. The hospitals in the Longwood Medical Area fund their own shuttle service, as do businesses in and around Cambridge’s Kendall Square. A single rider sat inside a private shuttle parked along Summer Street near the Federal Reserve building in Boston. Afar-reaching plan, funded by key waterfront firms, would consolidate 20 private shuttle routes into two bus routes to address traffic congestion in the area. The 128 Business Council started its first shuttle in 1987 — a 12-passenger van connecting the offices in Waltham’s Route 128 stretch with the Red Line’s terminus at the Alewife Station. The group now runs nine shuttles each day serving a broad area from Needham to Bedford. Patrick Sullivan, the business council’s policy director, said 45 employers and landlords contribute to the costs. Some workers pay and some don’t, depending on their employer and the route. The public can ride these shuttles, for a fee. Even if Peterson can line up the six corporate sponsors he needs by the end of September, it’s unclear just how much of a dent this consolidation will make in the Seaport traffic tie-ups. Convention center spokeswoman Katie Hauser said the plan would be to run 15 to 20 vehicles along the two routes in the morning and evening rush hours, reducing the total number of peak-hour Seaport shuttle trips from 130 to the 90-115 range. The convention center shuttles would probably carry more people, too: Hauser said her agency is considering 55-passenger buses, compared with existing shuttles that accommodate between 14 and 34 people.